Lucca, Tuscany, Italy, What's On. Welcome to Tuscany's Grapevine Magazine, on sale at local news agents or by subscription (post or online). To consult the monthly Calendar of Events (What's On In and Around) click on "What's On & other info" in the left-hand column. Click on the highlighted advertising pages in the list of Contents to meet our worthy sponsors.Italy, What's On. hat's On.scany, Italy, What's On. Sharing the view from his kitchen window. 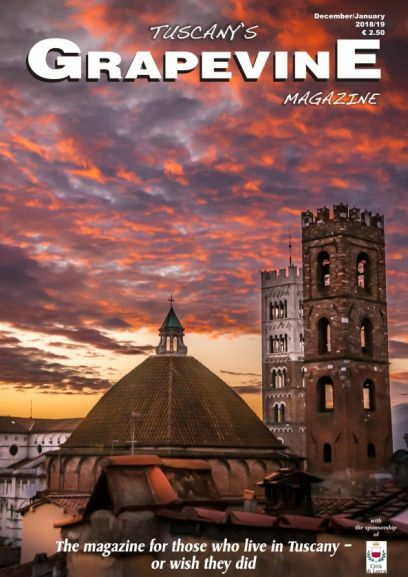 Tuscany's Grapevine Magazine, Via dell'Angelo Custode, 3A - Lucca Centro Storico 55100 - Italy. P. IVA 02416230460. Printed by Luminarprint srl Calcinaia (PI). Registrazione Tribunale di Lucca n° 4, 23 Feb. 2016. REA - LU 223932.